There is a fever sweeping Washington. A Biden fever. Is Vice President Joe Biden going to run for president? Is he already secretly running? Or is he about to rule out a run altogether? Countless journalists are chasing the will-he-or-won't-he story. And some have already made pretty confident predictions — which means looming embarrassment for the ones who got it wrong and brand-building opportunities for the ones who got it right. Most of the information has been attributed to anonymous sources. And much of it has been hedged with "likelys," "coulds," and "mights." Those words can make a huge difference — as MSNBC demonstrated on Monday morning. In the 9 am hour, anchor Peter Alexander, citing correspondent Kristen Welker's unspecified sources, said "Vice President Joe Biden will make an announcement, one way or another, within the next 48 hours." By the 10 am hour, the word "will" became "could." The comments from reporters and banners on the bottom of the screen were more hedged. A couple of hours later, Fox News went further, when chief White House correspondent Ed Henry reported that Biden is "expected to announce he is running." Henry tweeted that he had three sources and that they were "all urging caution" about the 48-hour timeline. Fox's on-screen banner simplified this to Biden "expected to run." The use of the word "expected" left open the possibility that Biden will surprise the people that are doing the expecting. Henry and his rivals have been on #BidenWatch — of course there's a hashtag — for weeks. Camera crews have been camped out near Biden's homes. Journalistic competitiveness, sheer curiosity and tips from sources are all fueling the fever. Brendan Boyle, a freshman Congressman from Pennsylvania, tweeted like a reporter on Monday morning, saying, "I have a very good source close to Joe that tells me VP Biden will run for Prez." Even Golf Digest is covering the Biden buzz in its own unique way: its headline on Monday was "Joe Biden, single-digit handicap, said to be on brink of joining presidential race." Previous so-called deadlines for Biden's decision have come and gone. The Washington Post counted 12 different reports of timelines dating back to August. In the meantime, Biden's deliberations are the story that keeps on giving — as in, giving television producers and columnists and reporters something to cover every day. 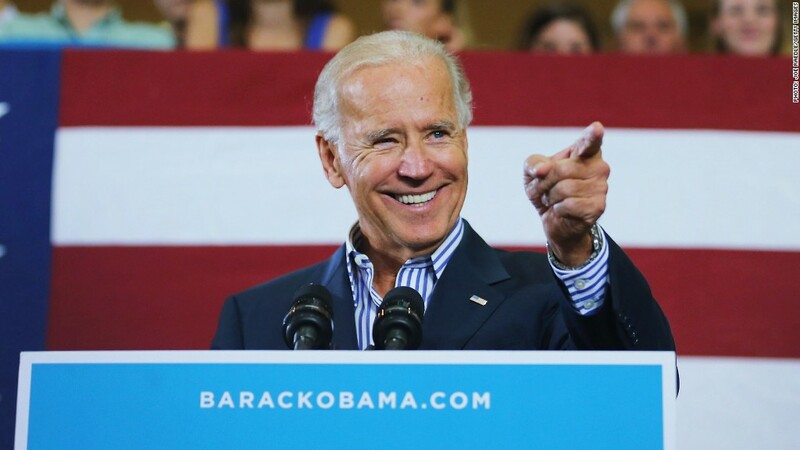 "According to the Wall Street Journal, Vice President Joe Biden is closer than ever to running ... aides for Biden are saying it is just a matter of when he is going to make the announcement," CNN anchor Christi Paul said Saturday. But it wasn't last Saturday — it was exactly one month ago on Saturday, September 19. It may turn out to be right, or not. On Monday, CNN reported that Biden's associates "are setting up interviews for potential staff positions on a Biden presidential campaign," citing "a source familiar with the process." Many signs point to yes — and some reporters have gone ahead and said Biden is already running. "We Are Already Months Into the Biden Campaign" is the title of Gabriel Sherman's latest New York magazine column. He argues that Biden is in the race, and just hasn't said so publicly yet. Others have taken the opposite view. Political scientist and Washington Post contributor Daniel W. Drezner wrote a "Rest in peace, Draft Biden movement" column last week. On Monday MSNBC's Steve Kornacki, who's been skeptical of a Biden run, shared a line from a 1991 Wall Street Journal article as a reminder of the limits of all the media coverage. It read, "All signs indicate that New York State Gov Mario Cuomo will finally jump into Democratic Presidential race on December 20." Cuomo famously didn't, dashing widespread expectations in Washington and elsewhere. So the clock keeps ticking. By 1 pm Monday on MSNBC, Welker, the NBC News White House correspondent, summarized her intel this way: "Two sources familiar with his thinking say that the decision will likely come within the next 48 hours. A third source cautions, however, that only the vice president knows when and what he is going to decide." And at the moment, Biden is not telling.